Myoma Myint Kywe (Burmese: ၿမိဳ ႔မ ျမင့္ၾကြယ္ , pronounced [mjo̰ mə-mjɪ̰ɴ tɕwɛ̀]; also U Myint Kywe ဦး ျမင့္ၾကြယ္ ; born 14 April 1960) is the founder (開祖) and chief instructor (首席先生 ) of the Soshiki Karate (組織空手) in Burma (Myanmar). He is also a famous historian (歴史家) and writer ライター (著者). He has been teaching for over 36 years since 1978 he served as Professor 教授 ศาสตราจารย์ and Chief instructor 首席先生 หัวหน้าครู of the Soshiki Karate Academy (Shotokan style 松濤館流), Rangoon (Yangon). He is a teetotaler during his lifetime. He and his father abstained from drinking alcohol and smoking tobacco in their lifetime. “Myoma” is not part of his given name but is an honorific. He loves his Myoma National school. 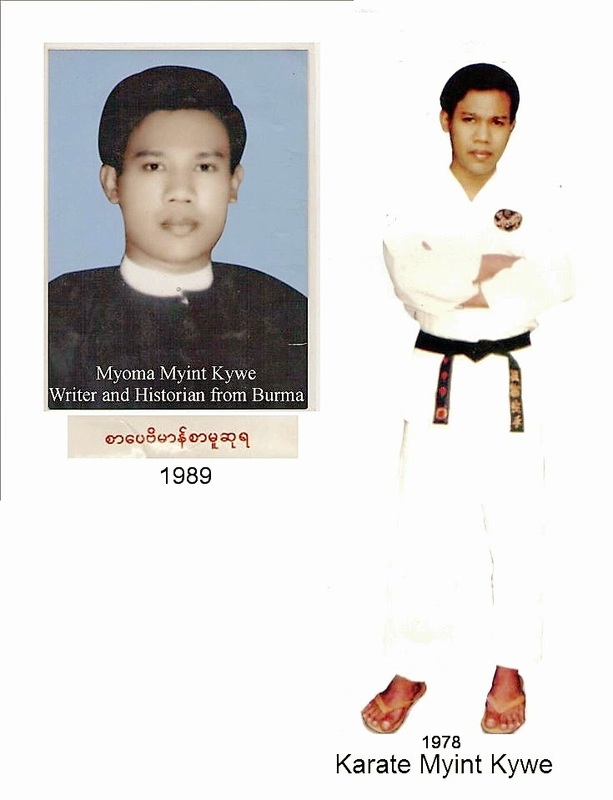 So he used his pen name as “Myoma Myint Kywe”. 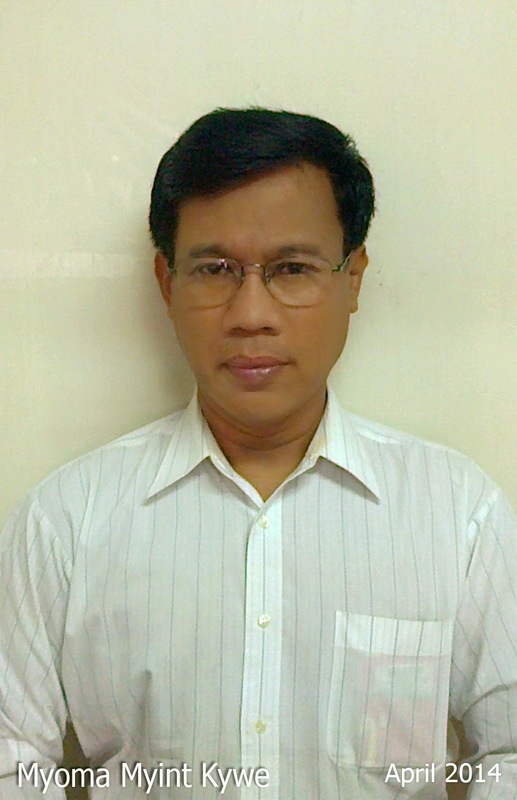 U Myint Kywe, M.Ed., D.M.E., D.T (Passed with Credit) is a bona-fide member of Myanmar Writers and Journalists Association. His grandfather, Bagan Set U Thaw ( ပန္းကန္စက္ ဦးေသာ္) , first inventor and owner of Burma plate and dish manufacturing factory, was also officially conferred the title of (T.P.S) by the British Government in 1940 and Naing Ngan Gonyi (First Grade), highest title by the Government of Union of Burma in 1980. He became very well known for his business work, patriotism, philanthropy, invention, scarifying, and leadership since 1918. He helped, provided food and any material assistance for many Burmese needed people in Burma between 1914 and 1980. (26 December 1924- 22 September 1983)( ျမိဳ႕မ ဦးသန္းၾကြယ္ ) was a teetotaler in his lifetime until he died, as well. Myoma U Than Kywe was one of the leaders of the Panglong conference along with General Aung San that initiated the formation of the new nation of Union of Burma in February 1947. He was one of the famous independent leaders of Burma since 1946 during the second World War. His mother Daw Ahmar (a) Daw Myint Myint Win (28 November 1931- 22 September 2012) (ေဒၚအမာ (ေခၚ) ေဒၚျမင့္ျမင့္ဝင္း) . She has practiced insight meditation of Mogok Vipassana since1983 until she died. She also explained and taught many children in her surroundings. Myoma Myint Kywe traveled to many countries such as Thailand, Singapore, China, Japan, Germany, England, India, Laos, Cambodia, Netherlands, etc., between 1987 to 2014. He attended courses and also gave lectures while abroad. He wrote about 150 books and booklets on culture, sociology and education especially about Buddhism. Therefore, he is also known as a Buddhist writer. He studied Judo when he was 9 years old in 1969. He started Karate martial arts training in 1970 when he was 10 years old. He studied in kihon, kata, and kumite regularly systematically. He taught real karate regularly systematically. He was very interested and practiced all techniques in Karate. Especially he practiced in applied Kumite techniques and powerful combat training of karate including one- on- one training, one- on- two training, and one- on- three training since 1970 until 2014. He attained the black belt 1st dan in Shotokan karate in 1976. 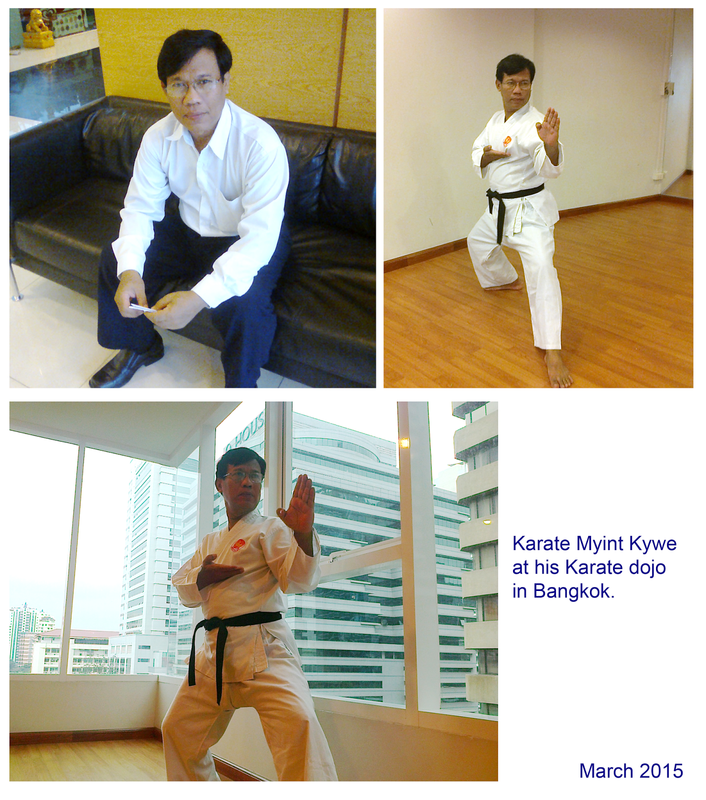 He established Soshiki karate school and Soshiki Karate Academy in Rangoon (Yangon) in 1978. He attained the rank of 3rd dan in shotokan karate in 1981. His teachers are U Maung Maung Than, U Tin Win Aung (a) U Po Thar Aung, U Myint Kyi, and Masatoshi Nakayama. "Myoma Sayagyi U Ba Lwin (or) Beginner of National Education" and "Special Remarkable Notes of Myanmar Culture and Notes on Youth Affairs" are the famous and the bestsellers of his books.
" I started Karate martial arts training in 1970 when I was 10 years old. I enjoy karate whether I'm teaching it or learning it. It's done a lot for me effectively and I've seen what it's done for so many others as well." However, I am always a "Senior Student" and "Junior Teacher" in karate. “We all karate practitioners must not be poisoned by the seven poisons such as: greed, anger, hatred, stupidity, conceit, jealousy and malice. We must do to cultivate the power of courage by strengthening our mind and body and overcoming any difficulties in our life". "We all instructors and students MUST abstain from all evil, killing, committing murder, suicide, stealing, lying, betraying, sexual misconduct, adultery, polygamy, intoxication, and BULLYING” he said. 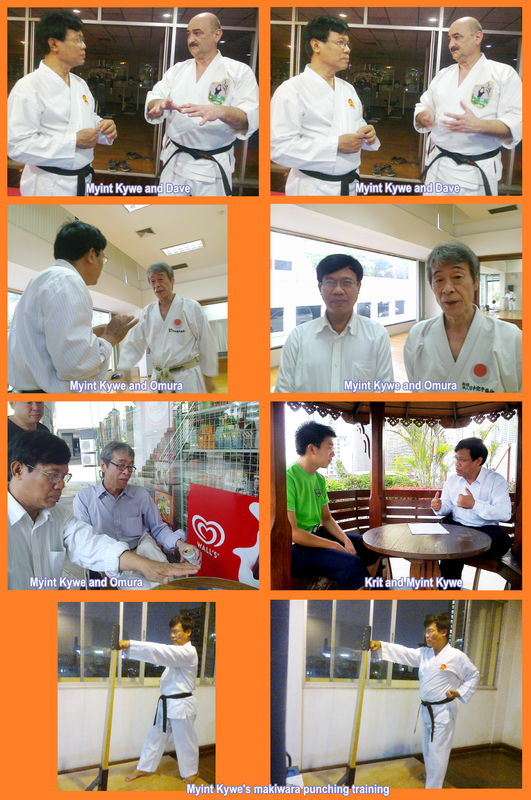 He has been teaching karate at his 組織 空手 Soshiki Karate since 1978. 組織 Soshiki meaning is: System and organization (の意味：システムを、組織). His wife is Khine Khine Win. His daughters are Thaw Tar Win and Su Su San. 40.Is it upper part wider while lower part narrower? 88.Do you know Vital Karate and valuable Karate? 102. What Is Declaration of Human Rights? 105. What is Myoma School? 106. How can we do survive from any crisis in the world? 123. When the cat is away, the mice will play. 125. Smooth words make smooth ways. 132. Love and cough cannot be hid. 137. It is never too late of learn. 138. He knows most who speaks least. 169. Why people don't believe in God? 170. Why People Love Jesus Christ? 191. Is the Japanese Karate sinking gradually? 196. Develop our Karate further! 198. How to punch fast and hard? 199. How to make powerful techniques of Karate? 200. Japanese’s 3 “K” is fading 褪色 !! 201. How to wake up karate! มิวม่า มิตร จอย (อังกฤษ: Myoma Myint Kywe; พม่า: မြို့မ-မြင့်ကြွယ်; เกิด 14 เมษายน ค.ศ. 1960) เขาเป็น นักเขียน นักประวัติศาสตร์ . เขาเป็นหัวหน้าครูของคาราเต้ ตั้งแต่ 1978. Myint Kywe เป็นชื่อจริงของเขา. เขาเกิดใน ย่างกุ้ง . Myoma Myint Kywe เป็นชื่อของนักเขียน. เขาเป็น ศาสตราจารย์ และ หัวหน้าผู้ฝึกสอน ของ SOSHIKI คาราเต้ ตั้งแต่ปี 1978 ย่างกุ้ง. พ่อของเขา Myoma U Than Kywe ที่เป็นนักการเมืองที่มีชื่อเสียง. เขาได้เข้าร่วมการประชุมด้วย Panglong Conference พร้อมด้วย General Aung San ในกุมภาพันธ์ ปี 1947. 彼の名前は Myint Kyweです。彼のペンネームが Myoma Myint Kyweです（ ၿမိဳ မ ျမင့္ၾကြယ္ ）。彼はラングーン（ヤンゴン）、ビルマ（ミャンマー）で1960年4月14日に生まれました。彼は仏教である。彼は、ラングーン、ビルマで1978年以来の組織 空手 Soshiki Karateスタイルの創設者である。彼は、ラングーン、ビルマで1978年以来の組織 空手 Soshiki Karateスクールの Chief instructor です。Soshiki の意味は次のとおりです: システムと組織. 私の空手の先生は、次のとおりです: U Maung Maung Than 、 U Tin Win Aung (a) U Po Thar Aung)、Masatoshi Nakayama 中山正敏（空手家首席師範）日本 空手 協会. ^ "Secretary-1 attends prize-presentation to National Literary Award winners". The New Light of Myanmar. 2004-12-12. Retrieved 2012-02-17. ^ "Winners of Sarpay Beikman Manuscript Award announced". The New Light of Myanmar. 2004-11-23. Retrieved 2012-02-17. ^ "Secretary-1 presents literary awards to literati". The New Light of Myanmar. 31 January, 2007. Retrieved 2012-02-17. ^ "Secretary-1 presents literary awards to literati". The New Light of Myanmar. 31 January 2007. Retrieved 2012-02-17.